Cilantro and Coriander are frequently used interchangeably but they are not the same thing. 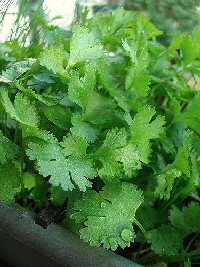 Cilantro is the leafy part of the plant, coriander are seeds produced by the plant. Fresh cilantro leaves have an intense flavor whereas the seed is mellow. Sun Requirements: Full to part sun. Will benefit from midday shade in the heat of summer. Soil: drained, light loamy soil, with a pH between 6.5 and 7.0. Spacing: Seed 1 or 2 inches apart. Feeding: Cilantro grows quickly and then bolts unless you consistently keep the plants pinched/harvested. Growing in compost enriched soil works best so the plants can take what they need when they need it rather than trying to keep track of the plants needs frequently. An occasional light feeding with a fish emulsion is ideal as the soil becomes depleted over the growing season. Growing from Seed: Cilantro does best seeded directly into a garden bed or wide shallow container. Sow seeds after the last frost and again in early autumn. Many gardeners seed a new crop every two or three weeks for continuous harvest, but cilantro will struggle in the heat of summer in warm regions. Problems: Cilantro is fairly heat sensitive and will bolt (sends up flowers and goes to seed). Northern and Midwest regions do not generally have trouble with heat. Cilantro can be grown in a garden bed but is easily grown in a shallow wide container. Use a good potting soil and add granular organic fertilizer, mixing well. The soil should be well moistened before seeding. Cilantro seeds are very small so cover very lightly with soil and mist every day or two very gently so seeds are not displaced. Cilantro can be grown using succession planting, sowing seeds about every two weeks to continuously produce new plants. Or, sow your seeds heavily producing one large crop, then consistently shear off a bit of foliage from a different section of plants each time you harvest. New leaves will continuously generate. In warm southern regions this method may result in many of the plants bolting before harvest due to heat. Also known as coriander, cilantro is harvested by shearing with a garden or kitchen scissor at the base of the stems just above the soil surface. Cut a few or a handful as needed, but try not to remove more than a third of each plant if you are trying to encourage each plant to continue to produce. If you are succession planting you can harvest a plant completely, there should always be another plant nearly ready for harvest. Cilantro is best stored with the cut stems in water, loosely covered and refrigerated. The cilantro leaves will remain fresh for weeks.